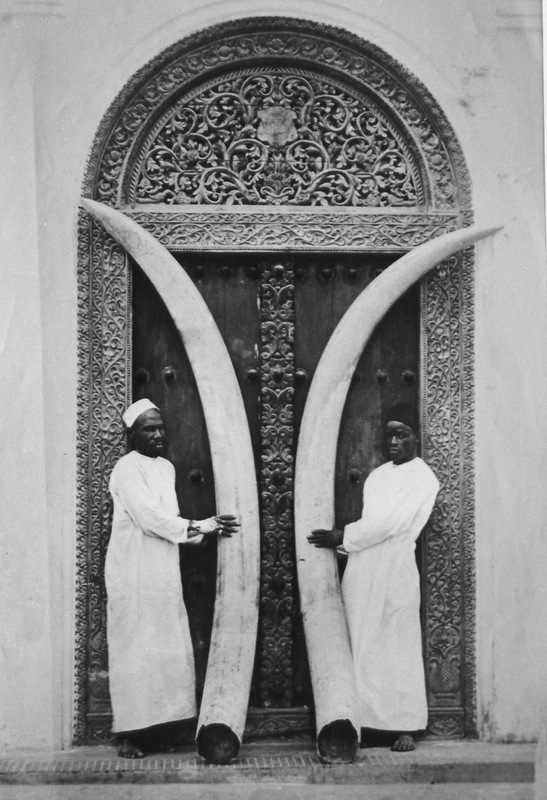 John Frederick Walker functions as a "memorist," with his soul rooted in centuries past, as he begins his tour de force examination of the history of ivory, humankind's lust for this exquisite treasure, and the demise of the elephant and human decency in the process of this unholy quest. 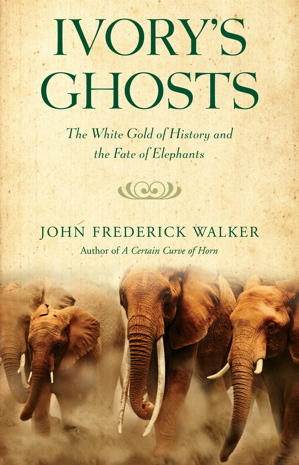 Ivory's Ghosts: The White Gold of History and the Fate of the Elephants opens with what amounts to a past life regression as Walker performs a hypnotic literary feat, transporting the reader to stand with a hunter at sunset on the slopes of Kilimanjaro as the stalker aims his rifle at an old bull elephant with a "withered hide." He aims and his mark is true. The old one would have sunk back on his hindquarters as his head dropped, burying the tusk points in the earth and assuming the posture of a sphinx; the heavy brow would have been propped high by the ivory posts, the trunk flopped lifelessly between. None foresaw that less than a century later the appetite of uncontrolled commerce would threaten to consume the bulk of the remaining sub-Saharan herds that supplied it; back then, elephants in the yet to be exhausted interior were said to be as thick as flies. At this juncture in Ivory's Ghosts, the reader is only on page three and should prepare for a dizzying trip through the ages, beginning in Paleolithic eras when carved mammoth teeth, now preserved, spoke for the voiceless giants. Tusks were carved, transformed into intricate jewelry, and ultimately buried as adornments in 28,000 year old human permafrost graves. Walker is a scholar and a perfectionist, but his meticulous examination of the allure of ivory reads like a novel that is impossible to put down. The atrocities perpetrated against elephant and mankind in the pursuit of white gold is the proverbial tale as old as time, with no end in sight. But, the reader desires a happy ending, and Walker does not sugar coat the fact that international disputes and especially the influence of China in modern times make the denouement look grim. China has elbowed its way into the committees at CITES (Convention on International Trade in Endangered Species) in spite of its inability to control its own black market in endangered species trade. Anyone who has been to central Africa will note the burgeoning influence of China in areas where human rights and animal welfare are of grave concern. China's recent trade pact with the Kabila government of the Democratic Republic of Congo for natural resources is a good case in point. Walker is able to present the politics of international maneuvering succinctly and takes a complicated subject, makes it palatable, and provokes outrage at the mess humans have made of wildlife management. That is the subtext of this book and the reason it works is that the story of ivory is compelling on its own. The United States does not get let off the hook. The ivory business in the Unites States took off with the boom of the industrial revolution. Factories in Deep River, Connecticut became the nexus for the exploitation of a resource found in Africa. When Deacon Phineas Pratt received a patent for a "comb-making machine," elephant "tusks were fed like logs into indefatigable machines." Imagine the smell of a dentist drilling into your teeth magnified a thousand times or more as ivory was fed into cutting machines that had to be water-cooled. The smell of burning animal product was disgusting as huge machines churned out piano keys and billiard balls by the millions. The sphere of a billiard ball had to test true and this meant that female elephants paid a huge price. The tusks of the female elephant are straighter and have a linear nerve channel, making the product roll well. Pond for pound, the source of the renewal of the elephant species was sacrificed for pool halls. Walker is a consummate storyteller, ably weaving conservation issues, politics, societal mores, international wrangling over treaties, anthropology, history, third world exploitation and slavery into a solid framework in which the history of the elephant and its compelling dentin tusks is a heartbreaking focus. Probably the best-loved and remembered elephant for Americans is the legendary Jumbo. He dies an ignominious death -- killed by a train. Walker's description of the stuffed behemoth, as told by Shana Alexander, has the mammoth being towed on a circus wagon with his "widow" draped in black with the rest of P.T. Barnum's elephants following and trained to wipe their eyes on cue with black-bordered bed sheets. But perhaps the most eye-opening vignette in Ivory's Ghosts has Walker standing in a storeroom in South Africa's Kruger Park. 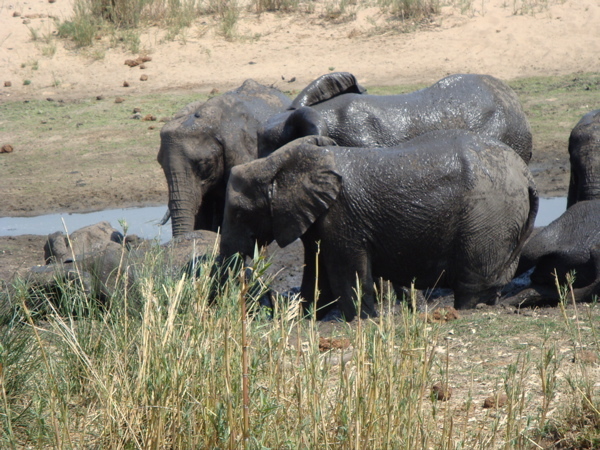 Kruger has a healthy population of at least 12,000 elephants. One of the by products of this success is tusks from dead elephants, or elephants culled because they threatened tourists or "flattened locals," but ivory bans require that this resource be stockpiled. Kruger is not the only park with stockpiles of ivory recovered from elephants. In fact, one to five tons of ivory a year pile up in warehouses of the parks' departments of a dozen African countries; Zimbabwe alone adds ten. There is little agreement about what should be done with this ivory fortune. But as long as there are elephants this mountain of tusks will continue to grow. Walker does not shy away from declaring that the demand for ivory is never going to disappear. It has been prized since the Paleolithic era, but this demand "need not be the elephant's curse." Walker's book makes a compelling case for the tightly controlled export of ivory from Africa. He takes on animal rights groups that have fought CITES-supervised ivory sales and urges that we all need to assure the future of the people of Africa as well as the elephant. After all, it is their resource. Ivory's Ghosts is certainly not the end of the story, but unless something is done, the world may face the end of the elephant. Walker maintains a blog where he makes a controversial case regarding legal ivory sales. The idea that any legal ivory sales will surely encourage poaching is the mantra of anti-ivory campaigners (and widely repeated in the media), but on examination it just doesn't stand up. It's very hard to prove a causal connection between the two, as serious researchers have discovered. TRAFFIC, the joint World Wildlife Fund / IUCN wildlife trade monitoring network, says there's no hard evidence that these sales will lead to more poaching or increased illegal trade in ivory. In fact, legal sales may help suppress poaching. CITES expects the recent sale of tusks, at which legitimate ivory reached $152 per kilogram, to undercut black market ivory, which was said to be going for up to $800 a kilogram -- and it's those inflated prices that provide the primary incentive for poaching in countries suffering from poverty and corruption. Whether you agree with this approach to conservation or not, read Ivory's Ghosts if you have any affinity for the history and future of this magnificent animal that has been sacrificed over the ages for what amounts to the white gold of its teeth. Finally, Walker takes a hard look at the fact that while Africa boasts pristine, successful game parks like Kruger, there are many areas on the continent where elephants are not only the victims of poaching, but where chaotic climate conditions bring drought -- a grim reaper that decimates the once great herds. Add to that scenario the problems created by knee jerk reactions of animal rights groups and "conservationists" who do not want to see any elephant culled, even if the animal is tramping villagers and decimating crops. Africa deserves the right to manage its own wildlife. This book is a provocative, fascinating and compelling read. Highly recommended. John Frederick Walker is a journalist, conservationist, and artist. His writing on a wide variety of subjects, from adventure travel to wine, has appeared in a number of publications, including The New York Times, National Geographic Traveler, Wildlife Conservation, and Saveur. He is the author of two books on natural history, Ivory's Ghosts and A Certain Curve of Horn. Walker has been traveling in, and reporting on, Africa since 1986, when he first became involved with endangered species conservation.